Electro deposition coating, or ED coating in short, is a process of coating the surface of an electrical conductor (usually a metal) via the use of electricity. The primary purpose of coating the material is to protect it from corrosive forces while enhancing the ornamental value of the material. Improvement of the scratch resistance and increase in smoothness of metal surface are few of the other benefits of the ED coating process. In recent years, ED coating has become an integral component of machine fabrication process and is one of the toughest corrosion resistant coatings. 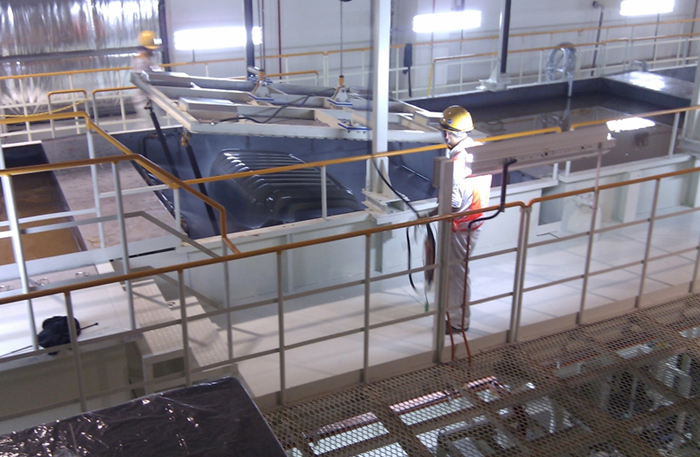 At GSE, we use the efficient dip coating concept to provide a uniform and complete coating on the material surface. Our unparalleled expertise guarantees a strong adhesion of coating on metals to deliver durable products with precise thickness requirements. We understand the need to have an uncontaminated surface for a quality coating process and hence we provide a series of pre-treatment processes to ensure a dirt-free material for the coating process. Moreover, we employ proper ventilation control to guarantee a dust-free environment. Subsequent to plastic coating your metals, we ensure a fine finishing by using curing as a post-treatment process. Another special feature of our ED coating process is the precise temperature and humidity control that is essential for a smooth operation of electro deposition. In the automotive industry, automotive parts such as truck head or wiper strips utilize ED coating technology. Additionally, the compressors of air conditioners and the metal casings of refrigerators are coated via electro deposition. Owing to our commitment towards the green environment, we employ several methods to recycle, thereby developing a cost-effective green technology for electro deposition coating process. All our products undergo rigorous testing to certify the highest quality standards for adhesion, uniformity and surface smoothness and cater to your machine fabrication requirements.